I grew up in Scotland and started skiing aged 7. My skiing has morphed somewhat from racing and resort skiing into ski mountaineering and onto Big Mountain Skiing. The ability to travel fast and light through the mountains on technical terrain really appeals to me requiring the right mix of the mental, technical and physical abilities to achieve that long dreamt about project of an aesthetic line on a big peak. Many will ask how someone from Scotland cane be a professional big mountain skier? Well, the late, great, Paul McLeod skied Mallory, Eugster, Col du Plan, Rond and Grand Envers in a day, about 15 years ago. I managed 4 runs on the West Face a to the road a few years ago, its a lot of skiing, around 12000 m of vertical. Although Paul was skiing to the mid station, his lines were significantly more technical, so it would be interesting to to see how far I could go one spring if I am in Chamonix and feeling strong. In my teens I discovered mountain biking and was a sponsored racer at National Level in both cross country and downhill. Riding for the Neill Ross Cycles 232 Race Team sponsored by Pace Cycles and the Italian eyewear company Briko. I placed 3rd Junior in the Scottish MTB XC Series, should have won the Scottish Series Senior Sport category as an 18 year but went to the Alps, got over excited and rode too much and only managed a 20th place in race 4 after finishing 1st, 2nd and 3rd in the 3 first races! I also got 3rd in the British University’s downhill and was awarded a Full Blue at university for cycling. Flow sports seem to suit me well, reading terrain and blasting through trying to be as smooth as possible and many XC wins were down to holding on for grim death on the climbs and suffering then going for it on the downhills. I think I exploited that young man’s false sense of immortality to the full, I don’t recall ever holding back or fearing I would fall, though when it went wrong it did hurt and my body reminds me of those times from time to time. That illusion of immortality has long since gone and now I go into the mountains with the objective to come back safe. I still love riding the local singletrack and recently did the Tour of Mont Blanc road circuit unsupported and alone – 8000 m vertical, 330 km, 18 hours door to door. I had my first taste of skiing aged 5 on a snowy Epson (horse) race course in the South of England but it wasn’t until my parents moved back to Scotland when I was 7 that skiing became a weekend obsession. Those winters in the 80’s were huge and unrelenting for 4-5 months. One of my friends got snowed in at the Lecht ski centre for over a week. Now I’ve more than 2 decades ski mountaineering experience – about 20 Chamonix winters, 1 in Les Trois Vallees and a couple in La Grave. When it comes to climbing, adventures have taken me to British trad E5, French 7b+, many Alpine North Faces including the Grandes Jorasses, Droites, Eiger and Scottish Winter First Ascents up to VII,8. One my most memorable moments was doing the first repeat in 25 years of the ephemeral ‘Mousetrap’ on the main face of Creag and Dubh Loch. This 300 m face had previously only seen 2 ascents since 1984. 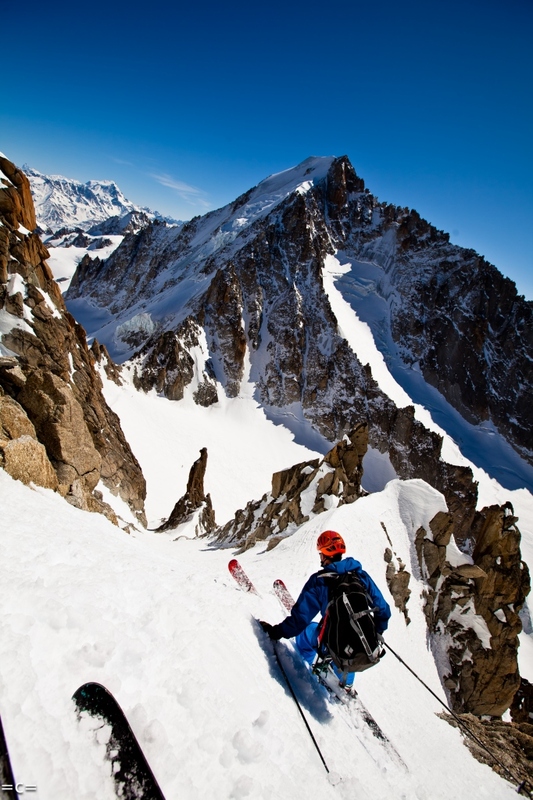 I am an IFMGA British Mountain Guide living in Chamonix. I have great sponsors and a big thanks goes to Black Crows Skis, PLUM, Julbo, Petzl, Mountain Boot Company, Lyon Equipment, Jules, Damian and Mandy at The Boot Room (Sanglard) and Graham and Colin at Footworks who keep me on the hill with fit in perfect condition. Skiing maybe an individual sport but there is a team of super heroes working hard for you in the background.